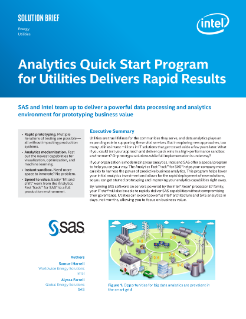 Read this brief on how SAS and Intel have teamed up to deliver a powerful data processing and analytics environment for prototyping business value. If your organization is modernizing your analytics, Intel and SAS oﬀer a special program to help you on your way. The Analytics Fast Track for SAS helps your company move quickly to harness the power of predictive business analytics. This program helps... lower your initial analytics investment and allows for the rapid deployment of new solutions, so you can get started prototyping and improving your analytics capabilities right away.